Halter is constructed with heavy duty triple-ply 1" polypropylene webbing and brass-plated hardware. Box/cross stitching, computerized web cutting & heat sealed reinforced buckle holes. Equipped with flat throat snap. 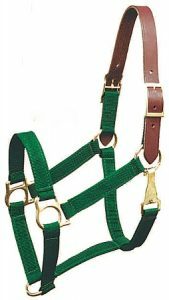 Leather crown is designed to break if halter catches to avoid injury to the horse. Quality crafted in the USA Full size.